Jeyoung Oh (left) with Orin Puniello of Ketchum and Dr. Tina McCorkindale of The Institute of Public Relations. 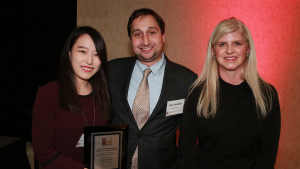 Jeyoung Oh, a doctoral student and two-time graduate of C&IS, was named the recipient of the prestigious 2018 Don Bartholomew Award for Excellence in Public Relations Research. The award, sponsored by Ketchum Global Research & Analytics and the Institute for Public Relations (IPR), selects a top graduate student in public relations, communications or business to acquire practical experience in public relations research at Ketchum New York and learn what research that matters to the practice means. Oh received the award at the IPR Annual Distinguished Lecture and Awards Dinner on November 28, 2018 at the Roosevelt Hotel in New York City. “I was very fortunate to have the opportunity to work at Ketchum this summer where I have gained a wealth of knowledge and research experience in practice,” said Oh. Oh’s research uses sentiment analysis of news media and Twitter data for predicting stock price. She hopes that her work will help bridge public relations academia and public relations practice together. With this award, Oh can further her academic and professional goals and ultimately help companies like Ketchum navigate the digital space. “I am motivated to better understand how public and influencer sentiment can affect businesses” says Oh. “I am excited to use this award to advance my research objectives even further. As the winner of the Don Bartholomew Award, Oh received a $7,500 stipend and a public relations research internship at the Ketchum offices in New York during the summer of 2018. Oh is also working to complete a research paper intended for use by practitioners. After the research paper is accepted for publication by IPR, Oh will receive a $2,500 grant for the paper. The award, which was renamed in memory of Ketchum communications luminary Don Bartholomew, recognizes Bartholomew’s leadership in the field of public relations and his passion for teaching the practice to others. Ketchum Global Research and Analytics (KGRA) is an award-winning, global team and the largest research, planning and analytics group in the PR industry. KGRA is committed to using innovative quantitative and qualitative research, along with digital, social and predictive analytics, in all phases of brand marketing, corporate reputation and employee engagement. The Institute for Public Relations is an independent, nonprofit research foundation dedicated to fostering greater use of research and research-based knowledge in corporate communication and the public relations practice. IPR is dedicated to the science beneath the art of public relations™. IPR provides timely insights and applied intelligence that professionals can put to immediate use. All research, including a weekly research letter, is available for free at www.instituteforpr.org. The College of Communication and Information Sciences’ faculty and students at The University of Alabama conduct cutting-edge research that creates knowledge and provides solutions to global issues across the full communication and information spectrum. To learn more about the College’s research initiatives, visit cis.ua.edu/research.